To get to Wantisden Valley you pass through Woodbridge on a north, north-east heading, left at Sutton Hoo and through the forest of Rendlesham. Take a left just beyond Butley, then left again and if you find yourself staring at the perimeter fence around the back of RAF Bentwaters then you’ve gone too far! In its own right, Wantisden Valley is a secluded Wedding Venue in the heart of East Suffolk. More recently it has become the home of Folk on the Farm, another iteration of Folk at the Froize at Chillesford, three miles west on the Orford Road. Since their inception in 2015, the monthly Folk at the Froize evenings have become extremely popular. Their unique feature being the hushed, attentive audiences that regularly fill the modest, converted dining room of this well-known restaurant. The one minor drawback is that there are a limited number of seats, which is where The Farm comes in! In March Folk on the Farm will feature a joint headline gig featuring two Frioze favourites. Tannara visit again from Scotland along with Danish duo Andreas Tophoj & Rune Barslund. Tannara last graced a Froize stage in August 2018 after a lengthy drive from Glasgow, heading straight back the next day. On this occasion their commute should be a little easier as they play at Cecil Sharp House in London the evening before. On that August evening they played outside, it had been a balmy Sunday afternoon which developed into a chilly summer evening – one of the audience offering harpist Becca Skeoch her shawl because she looked so cold on stage! By the time you read this, Tannara will have released their latest album, “ Strands”. It was launched at Glasgow Royal Concert Hall on 1st February and has been two years in the making. Lau’s Martin Green has been involved in the production and Mattie Ford features on percussion, the album being recorded and mixed at Mattie’s’ studio, Caribou Recording. Glasgow based, Stornoway lass Josie Duncan features on backing vocals. Oh, and Josie will be at the Froize on April 14th with Pablo Lafuente. 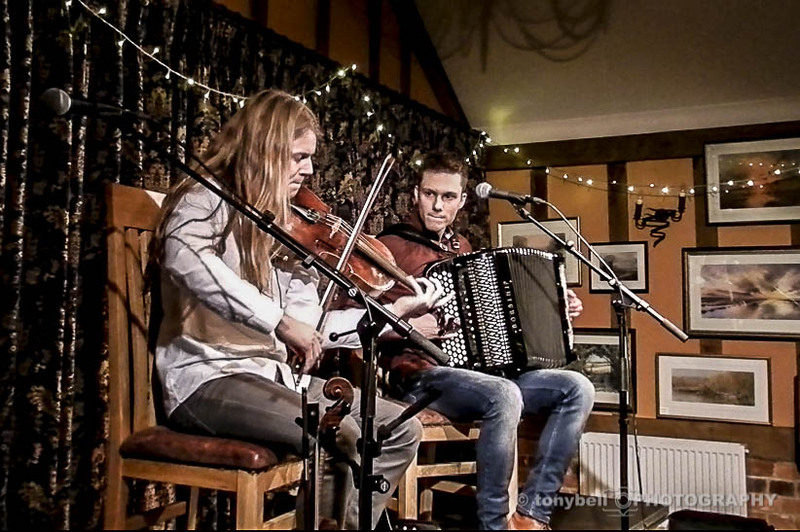 Can it really have been 2016 when Danish duo Andreas Tophoj & Rune Barslund last visited East Suffolk? Back then it was their first UK tour as a duo, and those who made it to the Froize that night, were royally entertained despite not understanding most of the Danish lyrics. But therein lies the power of good music, words become irrelevant. Andres and Rune are visiting the UK for a short five day tour. For musical inspiration they draw upon their Danish roots on the Jutland peninsula blended with their time living in Ireland, Finland and North America. This results in original compositions which evoke Danish traditions. None of which leads you to expect their cheeky stage repartee as they engage their audiences with tales about their travels and their songs. And of course we will all be keen to hear if Rune has a new car yet! Naturally, as with all Froize run events, there will be food. What has become known in Folk circles as “Suffolk Tapas” will be in plentiful supply from the kitchens at Chillesford. The food is included in the price meaning that you get to hear two fine bands and get fed a veritable feast for the ears and the stomach! It will be far warmer on The Farm for Tannara and Andreas & Rune will get to play to a bigger crowd. The team at Grapevine have seen both groups play and highly recommend getting along to Wantisden Valley on 15th March. In part that is why we started this piece off with directions! There are some wonderful opportunities to hear good music in our region, in some amazing venues off the beaten track. Be adventurous and seek them out, you will find some gems along the way and this, we think, is one. Andreas & Rune at Folk at the Froize in November 2016.